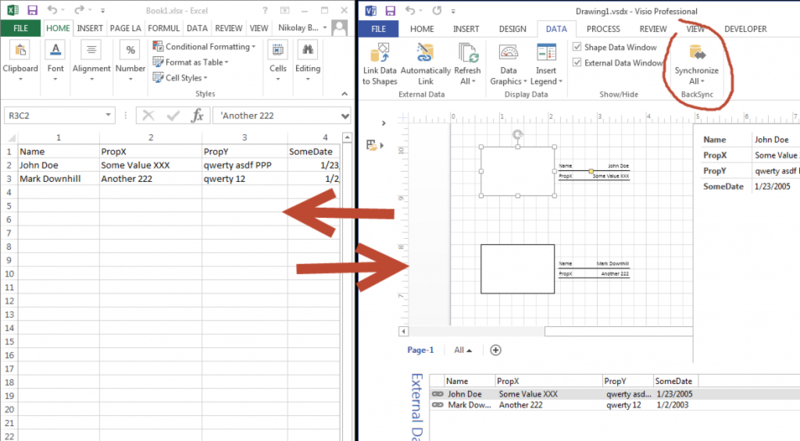 The is built on top of Visio shape data support; means, it’s compatible with existing data you may have already connected. But it will allow you to push data back to the source in a controlled manner. Before applying the modifications to either data source or diagram, the addin can show preview of the changes it’s going to make, so that you can review them and for example decide to skip some, or do something else for some. – Then, it analyzes the changes in the data source and on the diagram; if there are conflicting changes, it shows “Conflicts” and allows you to resolve conflicts in the resolution window. – If no conflicts, then it updates the data source directly, and then Visio document. Basically, the add-in adds a single button “Synchronize” to the “Data” panel. When you click it, a dialog is shown asking what data to synchronize (in case you have more than one data connection, you can synchronize them separately). It is very similar to the one Visio provides. In Visio, you just have “Update” instead of “Synchronize”. You can preview all changes which will be made before applying them, via special “Preview changes” mode. In this mode, no change is performed (“dry run”), but just analysis of what is to be changed where. The results are shown in the window. The add-in supports row addition and deletion to the data source. If you delete a shape, you have an option in the preview changes window to delete corresponding data from the data source. Note that for excel this is not possible with direct oledb data binding; you can enable direct deletion using automation in the settings (but for that excel needs to be installed). By default (without automation) the addin sets all row values to empty (null). The deletion works with other data sources though (SQL, SharePoint). If you add a new shape (by using “Duplicate” command for example, or by copy/paste of a data-bound shape), you have an option to add a new row to the data source. Note that new row should have a new primary key (if it is not generated automatically). To force that, the add-in suggests to clear primary keys when you duplicate a data-bound shape. You can keep them as is, in this case new shape will be bound to the same row (default behavior in Visio). Basically, the addin should work with any data source which supports update. Although, it was tested with Excel, SQL and SharePoint lists. Full source code is available for the licensed customers upon agreement. The addin is free for personal use (“community” edition); to use it in commercial organisation, a license is required. For testing purposes, you can run the addin run without any restrictions for 2 weeks, even in the corporate environment. System.Security.SecurityException: Customized functionality in this application will not work because the certificate used to sign the deployment manifest for BackSync or its location is not trusted. Contact your administrator for further assistance…. Hi Zdenek, yep, it does. Do you install directly from the website, by clicking the download link? What is your OS / brwoser / Visio version? It may also be, that adding this website to trusted sites may help (if you use IE enhanced security configuration). Installed it using setup.exe, now what? I cannot view it in visio 2010 anywhere. Hi, It should be available under “Data” tab as a new button “Synchronize”. Can you see it in your add-in list? (File -> Options -> Add-Ins)? Do you have other add-ins installed? Resolved by installing “stand-alone” installer. Will update the page. many thanks for your help and resolution via stand-alone installer download. 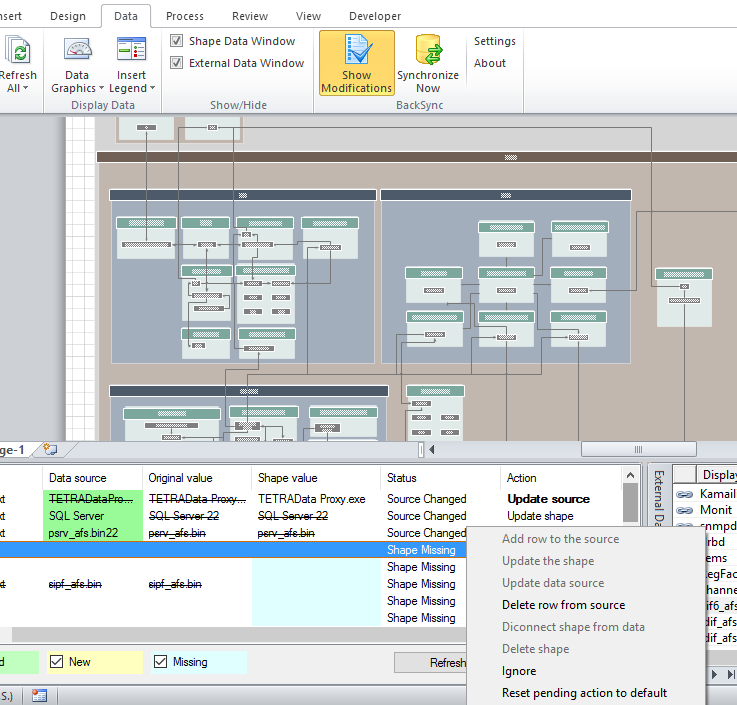 AddIn works now with Visio 2010 well.